My Mom's Best: Superman has fever too! 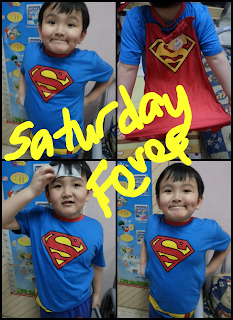 Just look at my Superman hero above, he has fever and today he went to school. We took him to see doctor yesterday afternoon and doctor gave him strong medicine knowing he has school to attend. My friends told me that if he's not going to school he will needs to show teacher the MC "medical certificate". I am glad he's able to go today and yeah my fault forgets to place one small book in his bag and missing out a subject book. He was complaining of his left ear's inside pain, this is caused by fever. Lucky the doctor prescribed the medicine that earlier doctor missed out. The Superman T-shirt I found for him, he loves it. It is the biggest size available which is size 12. I saw there's Batman T-shirt available too, you know we can never have both unless you can afford! How's your first week of January goes by, good or bad? Get well son super hero..